Bulk personalized aluminum bottle opener key holders with 4 detachable key rings. The 4 rings of our custom bottle opener key holder help you find any key quickly! We also supply wholesale blank (not imprinted) quad bottle openers for $1.89 each (minimum quantity: 100). 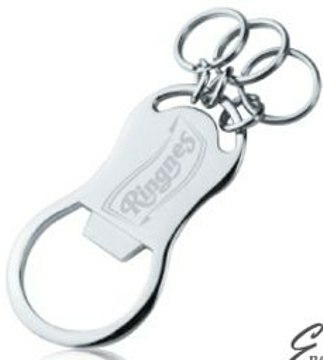 Budget Prices in USA and Canada for wholesale aluminum bottle opener key rings. Free artwork design. American buyers pay no taxes. Unit price below include laser engraving on ine side. Blank (not imprinted) 4 ring bottle openers: $1.89 each (minimum 100). Blank bottle openers ship next day. for personal assistance or for items you cannot find.